Compact Wide Floodlight: Its aperture measures only 4.5 x 11" (11.4 x 29.9 cm). Multi-Wattage, Multi-Voltage: It uses bulbs from 750 to 300 watts with 120 voltage. 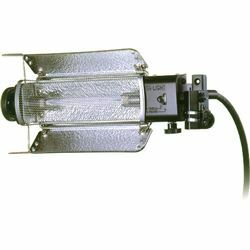 It uses 800 watt bulbs for 220 volt use. Adjustable Doors: Adjustable reflecting doors can illuminate four walls evenly from a corner or compensate for light fall-off from above or below.